One of my favorite times during the wedding day is when the bride, her bridesmaids and her family are getting ready for the big day ahead. These bridal preparations are some of the most cherished photographs from the wedding day. Emotion runs high during this time. Anticipation, nervousness, exhilaration, friendship and love are all embodied at this time. The bride, invariably, looks beautiful at this time. Her wedding hairstyle was just finished, her professional make up is perfect and her lovely wedding dress is fresh off the hangar. The sight of her ready for the big day brings forth an incredible amount of emotion from her friends, her family and the bride herself. 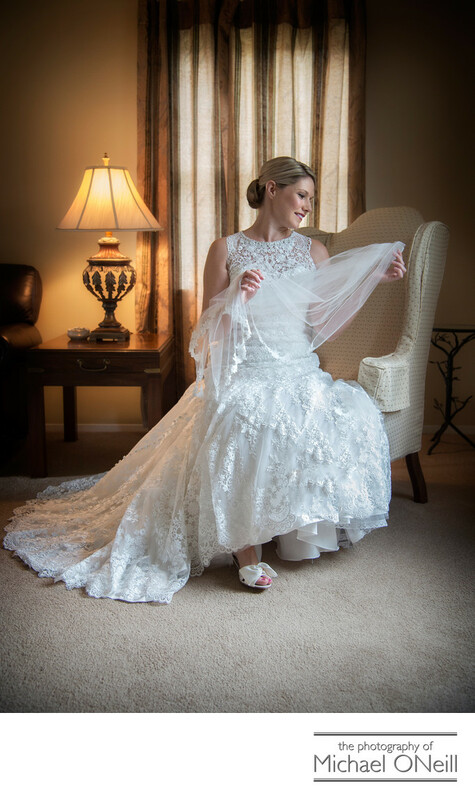 This image was created in the living room of the bride’s home, illuminated by the natural available light streaming in through a nearby window. A warm background glow is cast by the lamp on the table behind her. Whenever I get to the location where the bride’s preparations are taking place the first thing I do is scout out the perfect window for lighting my wedding pictures. It is all about the light when it comes to creating glamorous wedding portraits and I use this soft diffuse light for portraits of the bride as well as all of the pictures I’ll take of her with her maid of honor, her bride’s maids, her parents and her siblings.